One day after Trump officially launched trade war against China, and which saw an immediate, if confusing, response by Beijing, the Chinese propaganda machine has been unleashed to rile up the populace with nationalist fervor and circle around the flag in what Ray Dalio said was not just the first day of "trade war" with China, but the start of "war" , period. Sure enough, it did not take long for China's state media to lash out at the U.S. tariffs, with the prevailing message being that America’s "trade bullying" will damage the world and is doomed to fail (unless of course it causes the Chinese stock market to crash first and sends the Chinese economy in a recession as discussed earlier). The U.S. actions will "cause endless trouble in the future," People’s Daily, the Communist Party’s flagship newspaper, said in a commentary . The tariffs will not only hurt the interests of businesses and people in both nations, they will also threaten global free trade, impede the economic recovery, the paper said as translated by Bloomberg, adding patriotically that it will never knock China down. Meanwhile, the nationalist tabloid Global Times said in Saturday commentary that the trade war with the U.S. could be the “last-ditch effort” for China’s rise, adding that China must be more open rather than closed to counter external pressure. And, just like People's Daily, in a separate piece, the newspaper said Washington’s trade bullying will have no chance to succeed, and the push from the U.S. is stirring up indignation in China and making Chinese more clear-minded, more united and more self-independent. The so-called strategic rift between China and the US is not a conventional geopolitical contest, but a contest between the two countries' ability to sustain development. For a major country to develop, it must have the organizational ability to maintain social order and abundant social vitality and creativity. China has an advantage on the former, while the US is good at the latter. The US political system falls short on the first indicator, and some people believe that it will be difficult for China to make the latter a strong point. Crisis creates opportunities in Chinese philosophy. If China strives for greater levels of reform and opening-up as a result of the trade war, then the trade war will become a historic opportunity for the country's rise in a healthier way. We pray it will be the case. But the most "spirited", if ironic, response came from one of China’s top industrialists, Frank Ning, chairman of state-owned Sinochem Group, who said that "what Trump is doing is more than crazy" in reference to Trump’s tariffs, and also echoed the Chinese party line that the country’s businesses won’t be affected by the U.S. moves. 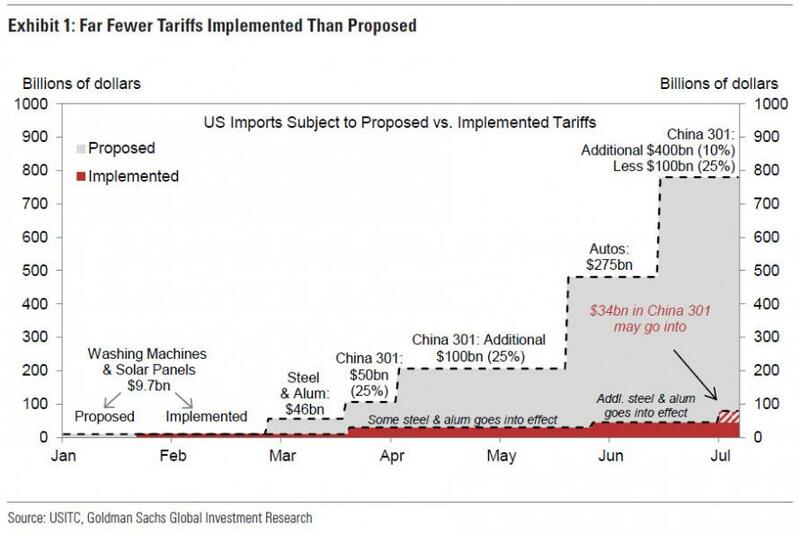 Almost as if China doth protest just a bit too much just how little it will be impacted by what could end up being $800 billion in tariffs (or more than it exports to the US). “The biggest victim from a trade war will be the one who initiates trade protectionism,” Ning said at the APEC China CEO Forum in Beijing on Saturday, adding that local companies will find a way to adjust. On flows of soybeans into China, which have been caught up the dispute, Ning said China would be able to find alternatives, or will simply go on buying U.S. crops shipped through third countries. Ning also predicted that the trend of globalization will see turbulence in the short run because of rising protectionism, but the direction won’t change over the long term, which of course depends on how he defines "long-term", and also whether Trump is re-elected in 2020, in which case Ning's may have to show just how patient he truly is. But the punchline was Ning's closing remarks, in which he cited Michelle Obama’s 2016 line from the last U.S. presidential election campaign that "When they go low, we go high." At this rate, the liberal #Resistance will soon make China - and its track record on human rights - an honorary member. That said, it was unclear at publication time if Ning is aware that the extensive use of that line to pitch Hillary Clinton in the 2016 elections ended badly for the Democrats. As for Trump, if China's collective propaganda response is an indication of just how nervous the nation truly is now that trade war is a fact, the US president may soon be using one of his own trademark lines from the last campaign, the one about "winning so much, you're going to get tired of winning." Finally, one can't help but wonder what happens to the sale of iPhones in China this quarter (and the next) now that a patriotic wave of anti-Americanism has been unleashed among mainland consumers. If history is precedent - and it probably will be when one recalls the plunge in Japanese auto sales in China after the 2012 East China Sea island dispute resulted in a nationwide boycott of all Japanese products - Tim Cook should be very nervous right about now.